SCSI-3 and SCSI-4 Persistent Reservations (PRs, target_core_pr.c) are a feature that is used for a number of cluster storage configurations for I/O fencing and failover/retakeover. PRs are a SCSI protocol feature, so they have been implemented in the LinuxIO engine, and hence can be used for all SCSI transport fabrics, such as FCoE, Fibre Channel, iSCSI, iSER, SRP, Serial Attached SCSI (SAS), etc. LIO also fully supports using PRs with Asymmetric Logical Unit Assignment (ALUA). The SPC-3/SPC-4 features implemented (in target_core_pr.c) are described below. For legacy environments, compatible reservation handling for SPC-2 needs to be enabled. APTPL=1 (Activate Persist across Target Power Loss) is using key=value /var/target/pr/aptpl_$T10_UNIT_SERIAL using sg_persist (announcement). SP_I_PT=1 (Specify Initiator Ports Capable) bit is supported and tested using sg_persist (announcement). LIO on Linux 2.6.29 connected to Windows Cluster 2008 using iSCSI. LIO IBLOCK, FILEIO and RAMDISK subsystem plugins are passing SPC-3 level validation for iSCSI target PRs. 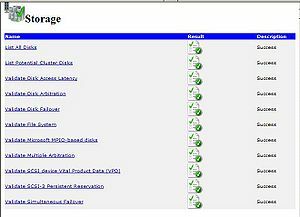 The following cluster clients that use Linux-iSCSI target mode PR have been tested. Test and validation for RHEL/CentOS was performed with GFS (e.g., with multiple writers). LIO capable storage objects from IBLOCK, FILEIO, and RAMDISK pass the fence_scsi_test. RHEL/CentOS uses SCSI I/O Fencing via the sg_persist CLI operation in sg3_util for Write Exclusive, Registrants Only and PREEMPT_AND_ABORT takeover using ext3 mounts. SPC-3 PR emulation is disabled on top of the pass-through SCSI subsystem plugin (this is WIP for existing SCSI devices). As of April 2009, LIO is passing validation using the MS Verification test suite. Test and validation for Microsoft Server 2008 Failover Cluster was performed using the MS domain validation suite. Microsoft Server 2008 Failover Cluster uses Write Exclusive, Registrants Only and PROUT PREEMPT for production failure cases. Extensive work by the LIO developer and user community has made this possible. If you are interested in further testing and want to deploy production services on our code please let us know. If you have an iSCSI Initiator that implements SPC-3 PR logic and would like to test it against LIO 3, please don't hesitate to contact us on our development mailing list. The iblock_0/lvm_test0/wwn configFS attributes are used to see world wide unique LUN information, be it real from the SCSI device, or emulated using a admin present value into iblock_0/lvm_test0/wwn/evp_unit_serial. This is required in order to use the NAA VPD device identifers. Linux support for client side PRs using sg3_utils and RHEL cluster scripts. The fence_scsi_test was originally written for RHEL clusters, and is available on a number of other Linux distributions including SuSE, Debian, Ubuntu, etc. The output of the client side fence_scsi_test looks like using Open-iSCSI Initiators connected to LIO. Note that the SPC-3 capable devices pass the simple PROUT REGISTER/UNREGISTER operations. This page was last modified on 29 September 2013, at 18:23.